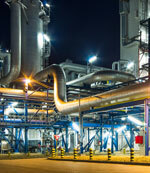 Industrial chillers are central to many upstream‚ midstream and refining operations. 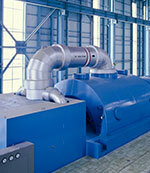 A chiller is a machine that removes heat from a liquid via a vapor-compression cycle. 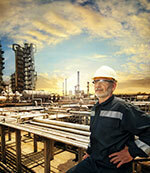 This liquid can then be circulated through a heat exchanger and then used to cool air or other process equipment. A vapor-compression chiller uses a refrigerant internally as its working fluid including R134a‚ R22‚ R410a and the most common R717 (ammonia). In addition to the working fluid‚ many standard and custom options are available when selecting a chiller; however‚ key components of the CIRCOR system include Howden compressor‚ control and starter panels‚ evaporators‚ condensers and required PLC system. Even though most engineers view the Industrial Chiller as ‘just a cooling source’‚ important parameters to consider are the operating temperatures and pressures as well as matching the cooling temperature requirements and refrigerant cooling characteristics. A key component of any industrial chiller application is matching the published specs with the product capabilities. CIRCOR does this as well and goes beyond the standard industry practices and publishes a performance guarantee for flow rates. Moreover‚ the use of a Howden oil-injected positive displacement screw compressor provides unique benefits such as constant inlet volume draw‚ is not affected by gas density‚ meets varying pressure differential requirements and low power consumption. SES International is part of Rosscor, a CIRCOR brand.